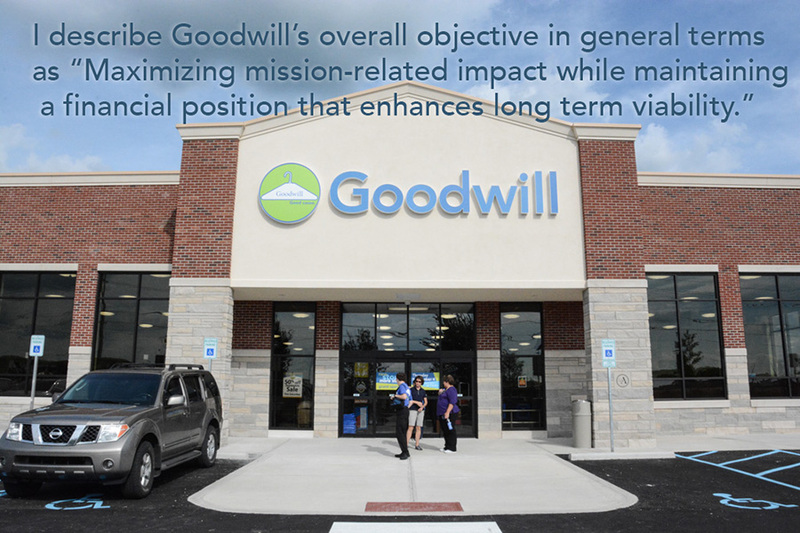 I describe Goodwill’s overall objective in general terms as “Maximizing mission-related impact while maintaining a financial position that enhances long term viability.” Of course, such a definition requires that we be able to define mission-related impact. And, despite the use of the word maximizing, the overall challenge is really one of optimizing. Many of our management challenges involve finding optimal solutions. For example, how much of our revenue should we spend on General and Administrative expenses (In the not-for-profit world, this is typically referred to as “overhead.”)? Some people believe not-for-profits should minimize G&A. In the long run, that is a recipe for ensuring less than optimal performance, as it results in inadequate value-added support of the high mission impact parts of the organization. Spend too much, though, and there could be legitimate questions about whether the organization is being a good steward of its resources. In this, as is in so many situations, one size does not fit all. Two very important factors in arriving at an optimal percentage are the size and complexity of the organization. In our large, very complex organization, somewhere around 10% of revenue seems to be close to optimal. While to some it might seem counterintuitive, a well-run smaller organization would likely have to spend a larger percentage of its revenue on G&A, as those expenses should not increase at the same rate as revenue. Another example: One of Goodwill’s historic roles is to provide work for people whose options are limited by disability, criminal history, low education level, or other significant barrier. This is a very important part of our mission and one way we can add unique value in a community. Obviously, then, we want to provide as many jobs as possible for individuals who don’t have many options. However, because retail is the financial backbone of our entire organization, we must have a sufficient number of people with skills that enable us to be competitive and efficient. If we do not have enough people with barriers who have the necessary skills, we must hire others who can fill the gap. In recent years, filling approximately 2/3 of the jobs in donated goods/retail operations with people who have employment barriers has generally seemed to result in an optimal mix. There’s another optimizing challenge embedded in that example, though, and that is the mix of full-time vs. part-time employees. We have quite a number of employees who for any of a variety of reasons are not able to work full time. However, if we have too few full-time employees, productivity can drop, and that will affect financial performance. External factors can also have a powerful influence on optimization challenges. For example, the Affordable Care Act has resulted in a large increase in the number of employees who have signed up for coverage under our health plan. While we’re glad more of our employees now have health insurance, this has greatly increased our operating expenses – so much so that we might find it necessary to reprioritize and determine a new optimal mix of operations and services and/or full-time vs. part-time employees that will enable us to continue maximizing mission-related impact while maintaining a financial position that’s good for long term viability. Nothing is static. Conditions are constantly changing, and we must constantly adapt or suffer the consequences. Optimization issues are always before us, and we’re always striving to find the best balance point – at least until something else changes. 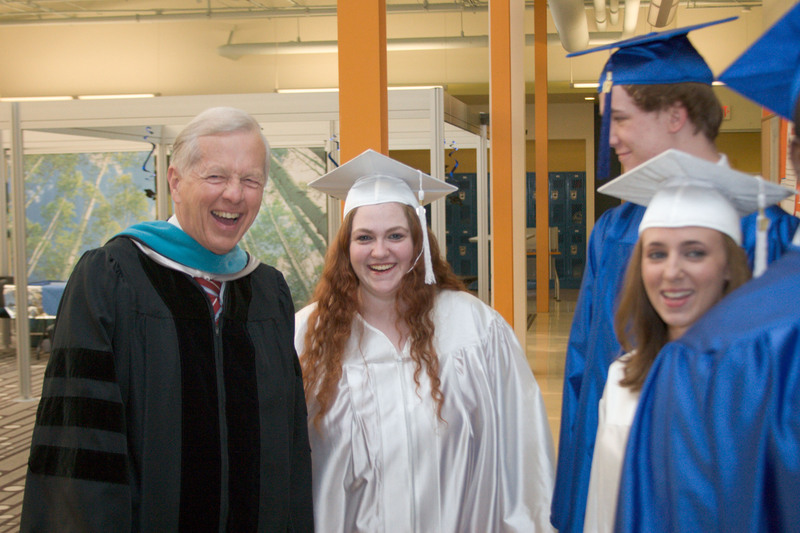 Jim McClelland shares a laugh with a graduate of the Indianapolis Metropolitan High School. Nevertheless, I don’t think we can overemphasize the importance of being a lifelong learner. This is particularly true for anyone who works or wants to work, as changes occur at such a rapid rate we have to keep learning just to stay current in whatever field we’re in or, in many cases, be employable at all. I’ve had the same title at Goodwill for forty years, but the work I do today is vastly different from what it was even a few years ago. In part, the changes in what I do and how I go about my work are reflections of how we have adapted to enormous changes that have taken place over the years in demographics, technology, the economy, competition, laws and regulations, and American culture. Goodwill has also changed in response to what we’ve learned from our own experiences, from the experiences of others, and from research. And we’ve changed as a result of the different perspectives, insights, knowledge, and skills of people who have become part of our organization and caused us to question old assumptions, ask different questions, and consider new approaches. From a personal standpoint, I have learned an enormous amount over the years from being in a position to work with people at nearly every level of society and in all parts of a community. I’ve also had the opportunity to work with a lot of people at national and international levels, try to understand their experiences and perspectives, and learn from them. The variety is tremendously appealing to me, and having those experiences has caused me to be skeptical of anyone who claims to have all the answers. I also read a lot. I read to stay current with what’s going on in the world and in my community. I read in hopes of learning something that will help me do a better job or be a better person. I read for insights and to learn about topics I’m interested in. And sometimes I read simply for pleasure and no other purpose. Most people in an industry are blind in the same way. They’re all paying attention to the same things and not paying attention to the same things. Insights come from new conversations. All too often, strategy conversations in large companies have the same ten people talking to the same ten people for the fifth year in a row. They can finish each other’s sentences. You’re not going to learn anything new in this setting. There is so much individuals cannot imagine simply because they are prisoners of their own dogma. The more you pay attention to information that supports your world view, the less you learn. You can’t use an old map to find a new land. While Hamel was writing primarily for leaders in business and industry, perhaps his admonitions could also be helpful in other aspects of a society that has become dismayingly polarized over many issues.